Camp surrounded by police. Nobody is allowed to go out or into the camp.No refugee no volunteers. Police is shooting with teargas. Some people are arrested (Don’t know how many). At the moment we don’t know what’s happening excectly and why. We are still inside the camp, trying our best. We will update as soon as possible! Police is gone. In the morning the police shot with teargas. In the afternoon they have arrested four people (as we know). 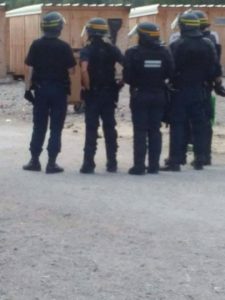 40 policeman were inside the camp, 20 of them with full combat gear. We still don’t know why the police was here. Any news will be published. At 10 o’clock in the morning, the camp is asleep, save for the scattering of individuals who are coming back after a night of trying to get to the UK. 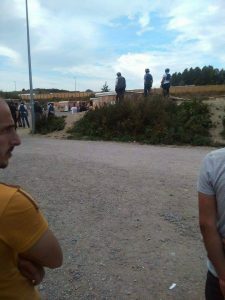 This morning, the police had come into the camp before we arrived and had fired teargas, and everyone was up and about. I bumped into three kids from the children’s centre, and they gestured for me to follow. A young girl pointed towards a plot of gravel outside her family’s shelter. Another one of the children – a boy less than two years of age – bent down to pick up what they were all pointing at: the black remains of a teargas canister. Outside the family’s shelter, there were four. A girl imitated the firing of tear gas. Another picked up a long stick and pretended to be hitting someone, explaining with few words what they had witnessed the police doing less than an hour earlier. The first girl put her wrists together and said, “Like this, like this” – someone had been arrested. 2.30pm. Lunch time. We had just gotten our plates of noodles and lentil soup from the food truck when other volunteers started coming to us, saying that the police were coming back and that we should make sure that the children are either with their parents or with us. We gathered the children who were in sight and walked away from the main path leading through the camp. 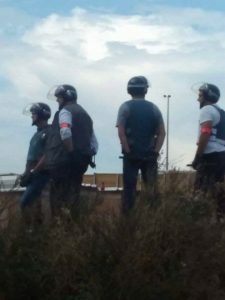 Two other volunteers and I sat down beneath some sheltered trees and watched as a squad of roughly fifty police officers, with helmets down, shields up, and armed with tear gas guns, marched into the camp and past where we were sitting. Throughout the next hour, we kept seeing groups of police officers leading men and women out of the camp. Everything was relatively quiet. We decided that we had to open the school again after the police had left. Although we didn’t expect many of the children to leave their shelters, many came. They watched Pink Panther. They played foosball. They solved a 3D puzzle of the Eiffel Tower. They could be children. 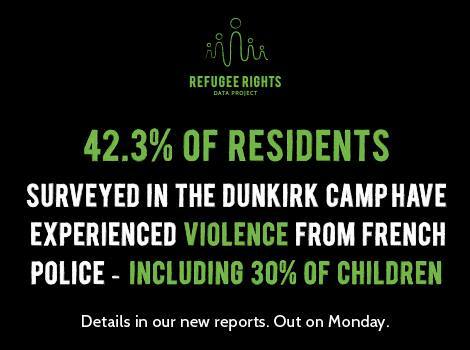 Five residents of Dunkirk refugee camp were on Friday sentenced to up to 36 months in prison, one of them a mother of 3 young children and a kind and supportive presence in the Womens Centre. She was taken away without explanation in front of her children’s eyes – one of them just 11 months old – as they stood on crying. 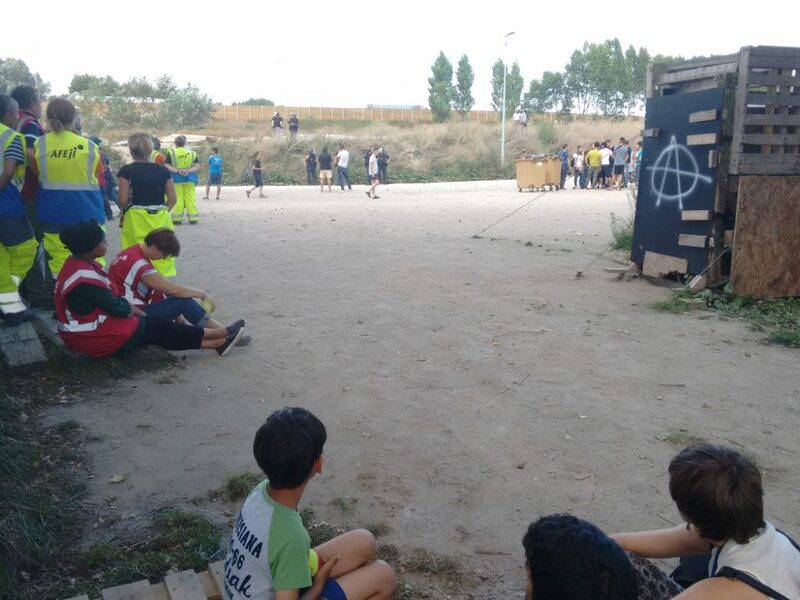 The five people were arrested for throwing stones at police officers after they entered the camp in an aggressive operation, using tear gas against children and adults. What this biased and highly misleading (the policeman deemed ‘brutally attacked’ and ‘badly injured’ in fact suffered no serious injury and was granted just one day of temporary repose from work. And the photos are not even of the camp) article does not talk about is what has been left behind – confused and hopeless families with yet another reason to distrust authorities. We fear for the welfare of the young children now separated from their mother for 3 years. This is not justice. If you know of children’s rights groups or individuals/organisations who can help, please contact us. It is the shameful refusal of the UK government to provide safe legal means to enter the country, despite their obligations to do so under international human rights law, that allows those called ‘people smugglers’ to function. Violent crackdowns are not the answer.